Product #20545 | SKU 303-2102 | 0.0 (no ratings yet) Thanks for your rating! 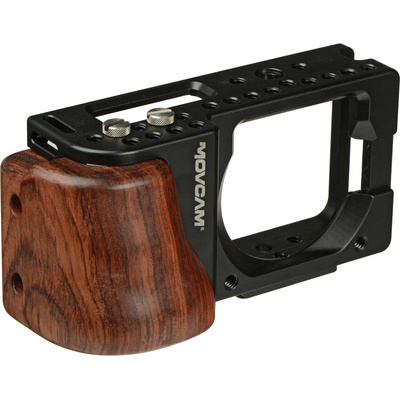 The Movcam Body Cage For Blackmagic Pocket Cinema Camera is a black, anodised, full body, protection cage for your Blackmagic Pocket Camera. You slide your camera into the cage and use the two included mounting screws to secure the camera into the cage, which features a mounted wood handgrip and 1/4"-20 accessory mounting holes so you can mount accessories to your camera without stressing the body. The cage protects your camera body, while allowing full access to your camera's connection ports, LCD screen, and battery compartment. The front of the cage is relieved where it is covered by the wood handle to reduce weight, and a rubber pad cushions the camera where it contacts the front of the cage. Machined into the cage are two slots for optional accessory straps. On the bottom of the cage is Movecam's Lightweight Support System, which allows the cage to mount to an optional Movecam Camera Spacer. Lightweight at only 255.2 g, the cage is made from anodised aluminium for corrosion resistance and durability. Nineteen accessory mounting holes are distributed on the side and top of the cage. This allows you to add optional accessories without stressing your camera's body. A removable wood handgrip is fitted to the cage, providing you with a more comfortable way to hold your camera/cage than holding onto metal. Slots above the handgrip allow you to attach optional accessory wrist straps.